The Skyliners juvenile skaters, gold medalists. Skyliners novice line, winners of the silver medal. 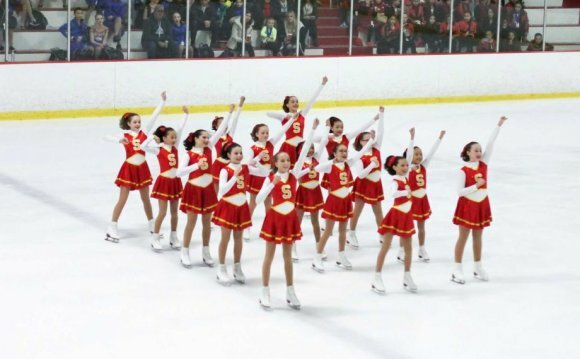 The Skyliners Synchronized Skating Team traveled to the 2016 Eastern Synchronized Sectional Championships on a mission to perform their best and earn the coveted spots to the National Championships. Novice and Intermediate lines earned silver medals and the Juvenile line earned the gold medal and were crowned the 2016 Eastern Champions for the sixth year in a row. "We are so proud that each of our lines performed at the top of their game at Easterns and that all of our qualifying lines earned a place at the 2016 National Championships, " said Josh Babb, Skyliners Head Coach and Director of Synchronized Skating. "Now we’ll be working hard to get ready for Kalamazoo." Easterns took place four days after the storm of the season hit Richmond, just in time to clear the snow for more than 2, 000 synchronized skaters who gathered to compete there. Of those, Skyliners sent 100 skaters ranging in age from 8-18. "To have our talented skaters on Skyliners earn medals at Easterns was amazing, " said Sarah LeBlanc Blosat, Skyliners Director of Non-Qualifying Lines. "For many of our younger skaters, this was their first Easterns Championship and an exciting culmination to all their practice over the season." Skyliners will now devote the early part of February to preparing for the 2016 U.S. Synchronized Skating Championships, which will take place in Kalamazoo, Michigan from February 23-27. In addition to Skyliners Juvenile, Intermediate and Novice who all qualified for these Championships, Skyliners Junior and Senior - both designated TEAM USA - earned "buys" to Nationals and will be traveling there as well. But before Nationals, Skyliners Junior line travels to Rouen, France to compete as TEAM USA for the second time this season at the 2016 French Cup. After their first place finish at the 2016 Leon Lurje Trophy in Sweden, all eyes are on the Juniors to repeat their high caliber performance on the international stage.